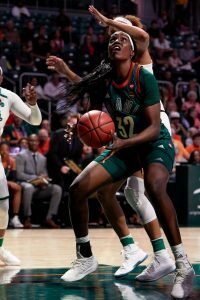 The Miami Hurricanes had a business trip in Winston Salem, North Carolina this weekend, as they took on the Wake Forest Demon Deacons in an ACC matchup. The only demon in the series, however, was slugger David Thompson’s bat. 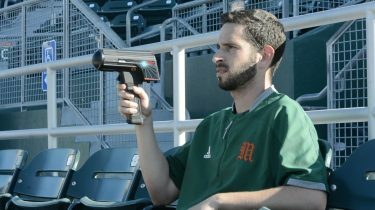 The way the junior third baseman has been stroking the bat lately drew attention from the national media. Before the series began, Thompson had been recognized as the ACC player of the week. After this weekend, he may be in the running for National Player of the Week. Miami (18-7, 6-3 ACC) took two out of three games against Wake Forest, scoring a total of 31 runs. On Friday, the Canes opened up the series with a 15-3 win. Three players combined for four home runs on the day, including two from Thompson. Thompson’s first at bat resulted in an RBI double, his second at bat was a grand slam (his second in two weeks) and his third at bat was another home run – something out of a video game, though those numbers are rare for even a video game. Other standouts during Friday’s game were outfielder Ricky Eusebio, who hit his first career home run and catcher Garrett Kennedy, who hit a monster two-run shot over the right field wall. Head Coach Jim Morris told WVUM 90.5 that Kennedy is the most improved player on this team. He hit a home run on Friday and Saturday, and on Sunday, he extended his hitting streak to 11 games as he ripped three base hits. Miami had a total of six home runs this weekend, a fair combination of the lower seams on the baseballs this season, and the right field line, which is a bit shallower at 315 feet. As for pitching, aside from Thomas Woodrey’s superb outing on Friday, pitching six innings with two earned runs, Miami’s starting pitchers were not at their usual standards. 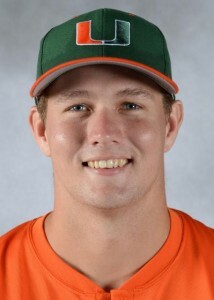 On Saturday, the Canes won 12-7, but the bats had to bail out star ace Andrew Suarez who struggled early on. On Sunday, however, Miami’s offense was unable to provide Enrique Sosa the insurance runs he needed. The Hurricanes, unable to complete the three-game sweep, fell to the Demon Deacons 10-4. Sosa only went three innings, as he was rattled since the start of the game, giving up two runs in the first inning. 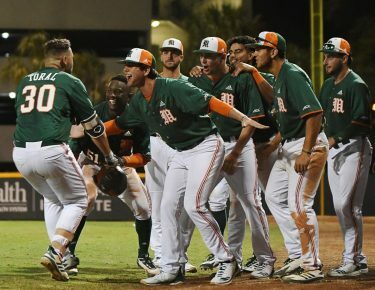 The offensive fireworks are a nice continuing development for Miami, however, as it secured its second straight ACC series win after sweeping N.C. State last weekend. The Hurricanes return to Coral Gables, Florida Wednesday night to play Florida Gulf Coast University at 6 p.m.